I have always loved the sciences, and will totally own I am a geek through and through. In college, I ended up studying chemistry and biochemistry. It is what indirectly got me into homebrewing, and eventually into opening a brewery of my own. However, in working on a project for one class, I started doing research on flavor chemistry. This led me to discover Harold McGee’s books: On Food and Cooking and The Curious Cook. These books let me look behind the curtain of what was going on in the kitchen, and come to the realization that every day, in how we select, prepare, and cook our food, we perform this incredible science experiment balanced by a healthy dose of art. From that moment on, I became a foodie. A few months ago, Joel and I were tasting Eddy, our saison, and we started talking about what foods would pair well with it. Eddy is not a spiced saison, but there is a long tradition of using spices to make saisons. Thinking about different flavors, we decided to pilot some different spices and herbs to see how the flavors would interplay with our beer. We sampled. We took notes. We sampled some more. We took more notes. By the end of the extensive sampling sessions we usually hatch grandiose schemes, but we reign those in, and start talking about what other flavors we want to try. Partially we do this to help us develop a better understanding of what works, and what does not work, with the flavors of our house saison yeast strain. Mostly, however, we do this because it is fun. We love throwing the kegs on in the tasting room, and seeing what our friends think of them. Every weekend, when the tasting room opens, we have a group of regulars who pop in, and right after saying hello ask, “What is this week’s infusion?” It has become clear that this series of beers have taken on a life of their own. So, we thought you’d like to know what’s coming up this week Does freshly picked basil sound interesting? 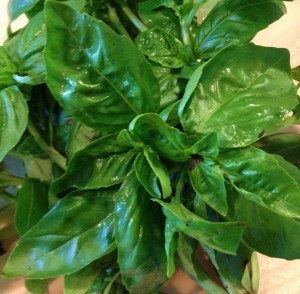 We received some beautiful Italian Basil from Middle Intervale Farm in Bethel, ME in our farm CSA two weeks ago. My family sources our meat, eggs and veggies from Middle Intervale Farm and we feel lucky to have such farm bounty so close to home. Cynthia was kind enough to drop off a big bag of freshly picked basil for us to use with our latest CSA pickup. We are very excited to see how this turns out, and Joel and I hope you get a chance to come in and enjoy this beer with us this weekend.